As an engineer, and a red blooded male I’m commonly guilty of engineering overkill. 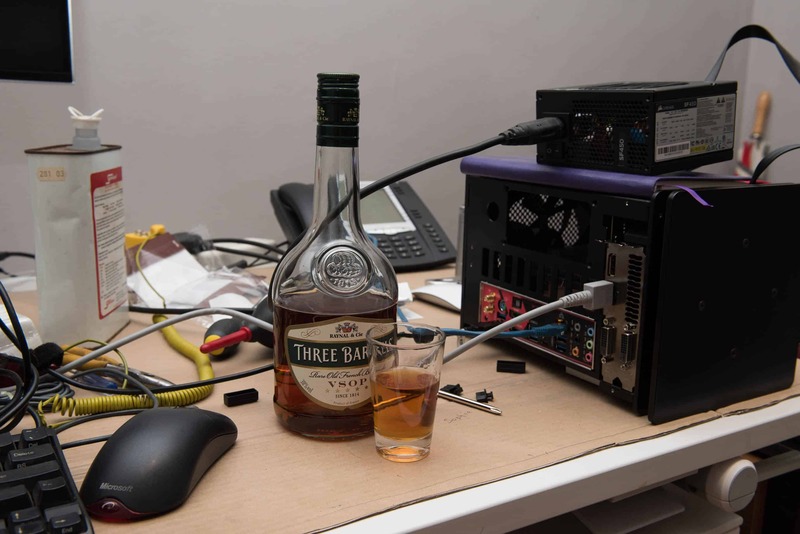 Some of my past workstations were incredibly over the top comprising dual water cooled CPUs, PC Power and Cooling power supplies (remember them? ), ECC memory and hot swap drive bays (in case of an urgent failure requiring action on my gaming RAID 5 drive of course!). 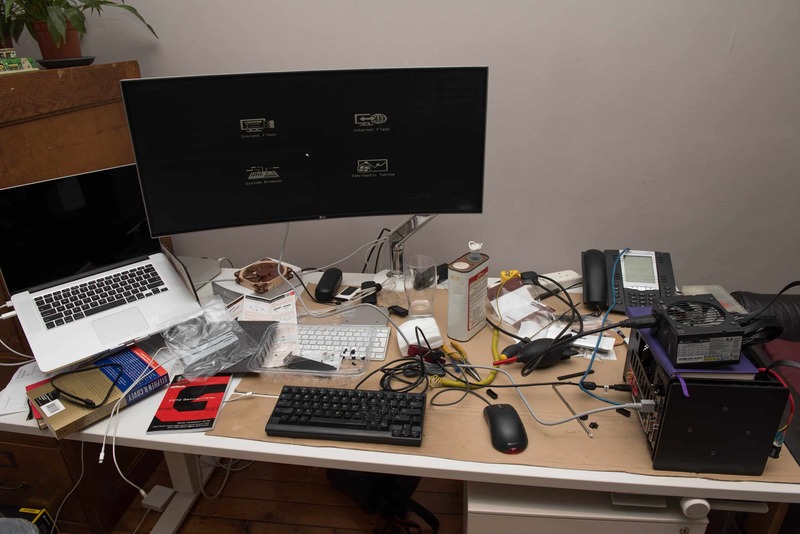 Age and time commitments to a small family however have forced me to be a little more practical and so it was that I approached replacing my Mac Pro 2013 workstation with an entirely fresh perspective whilst retaining some of the overkill aspects. 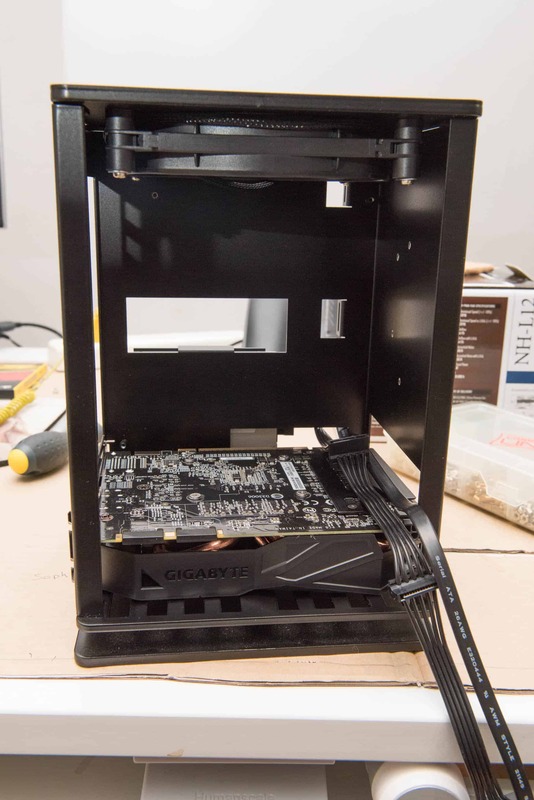 For one, my new workstation had to be small – as small as possible in fact by utilizing the newer Mini-ITX motherboard standard. 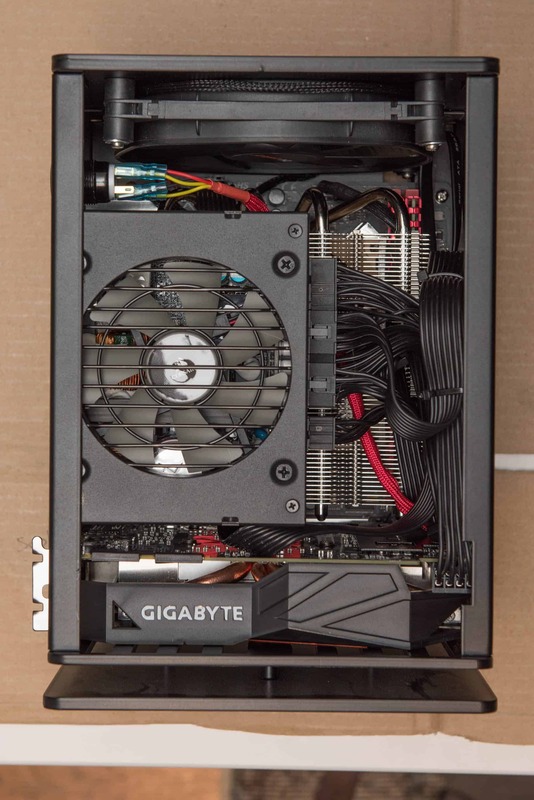 In addition it had to also accommodate a full sized or as near to full sized Geforce or Radeon graphics card. As a former gamer who has no time whatsoever to game I like to ensure my PC can hit 60 FPS at high resolutions . As I said, overkill habits die hard. 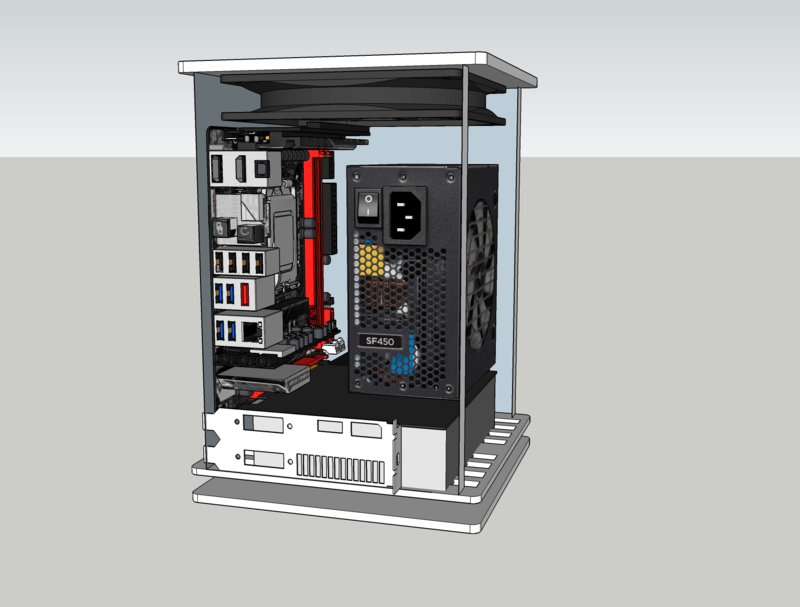 My final stipulation on this build was that it should not compromise performance and be able to accommodate Intel’s flagship 95W CPU. This was a tall order and required a lot more effort to realize than I anticipated. Mainly because I had to (wanted to?) 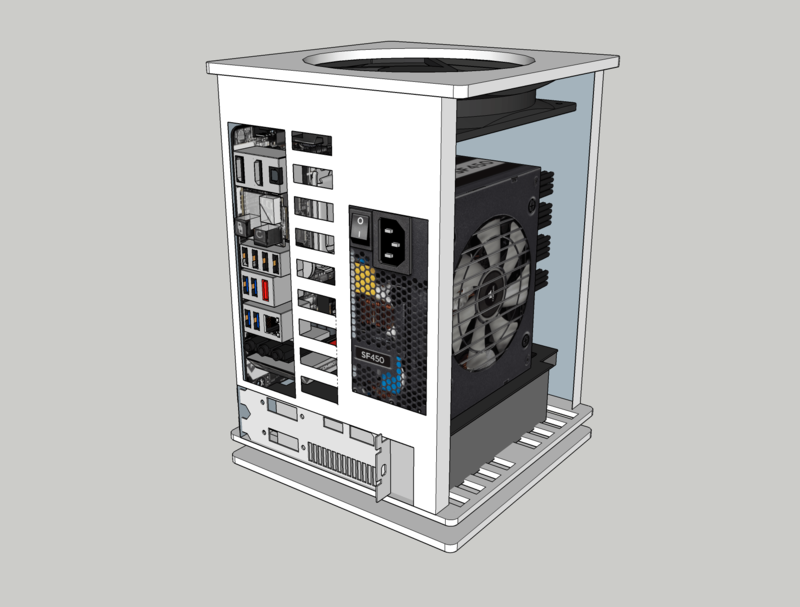 3D model the entire build to verify heatsink compatibility in such a cramped case. 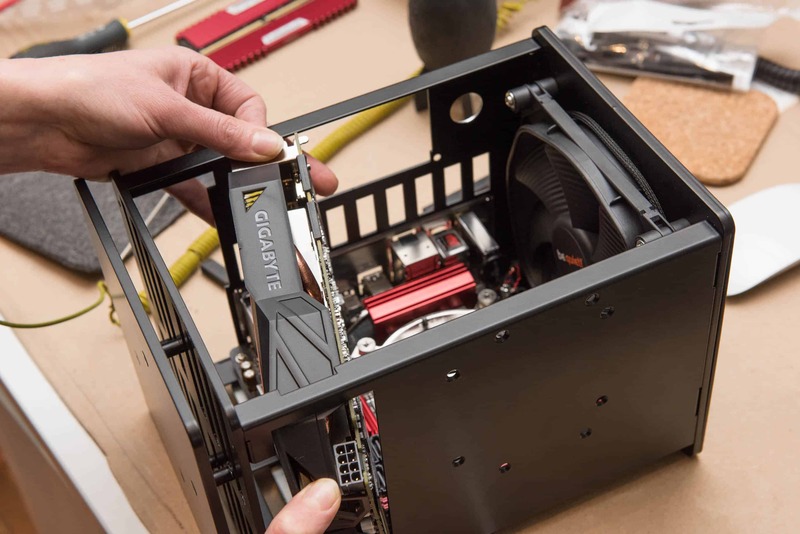 With ITX builds you have to start with the case. 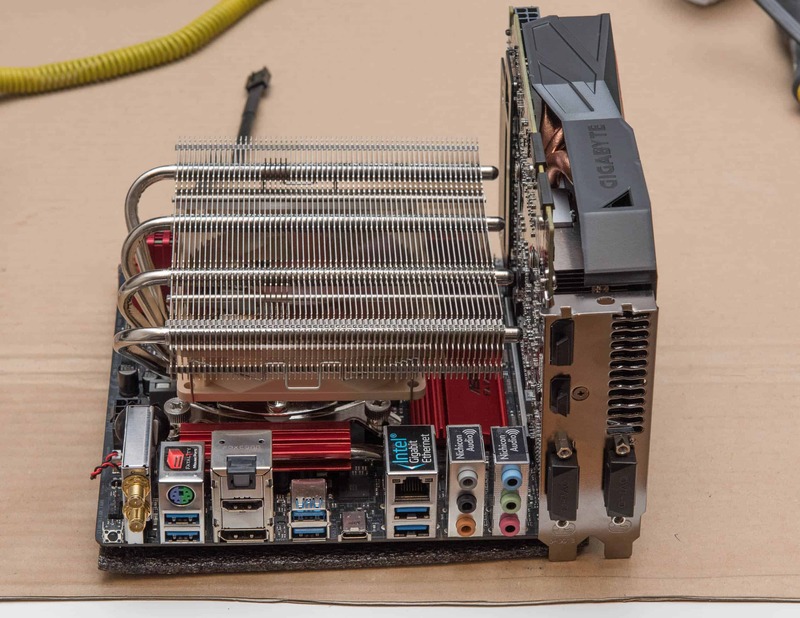 It dictates every aspect of thermal and physical sizing of components and with that in mind my top contender was without doubt the A4-SFX. After missing out on the initial sale I did some case hunting and came across the stunning HG Osmi case. Despite the oft mentioned difficulty of working with it, I was quite taken with its looks. It’s the best looking ITX case out there IMO and with its single fan and chimney style airflow seemed to have paid decent homage to Apple’s 2013 Mac Pro. One thing I couldn’t decide on was whether to reuse a 960GB Crucial M500 SSD I had lying around or to order a new Samsung 960 Pro 1TB M.2 drive instead…I was originally hoping to use the M500 and upgrade to a M.2 drive later but the Osmi is a complete and utter bugger to open up after the fact. In the end economics worked out and I stuck with the SSD I had. After many hours of grabbing dimensions, measuring and sketching I was able to (semi) conclusively determine that the clearance I had was 76mm. 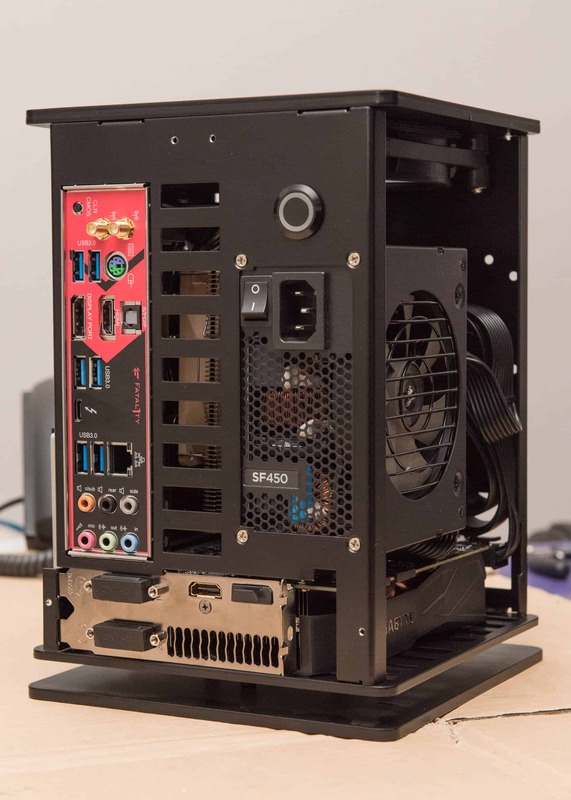 Since the case is only capable of mounting one (?!) fan – the quality of the fan was of paramount importance. The case included a be quiet! 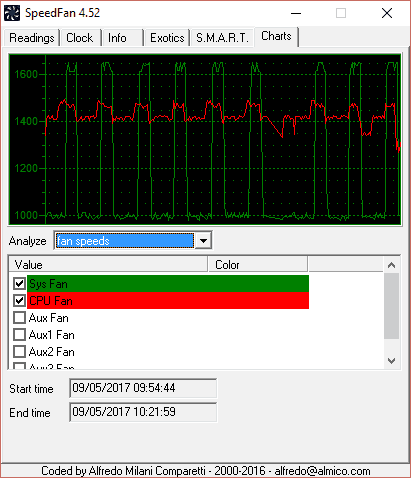 Pure Wings 2 fan which was damn silent. 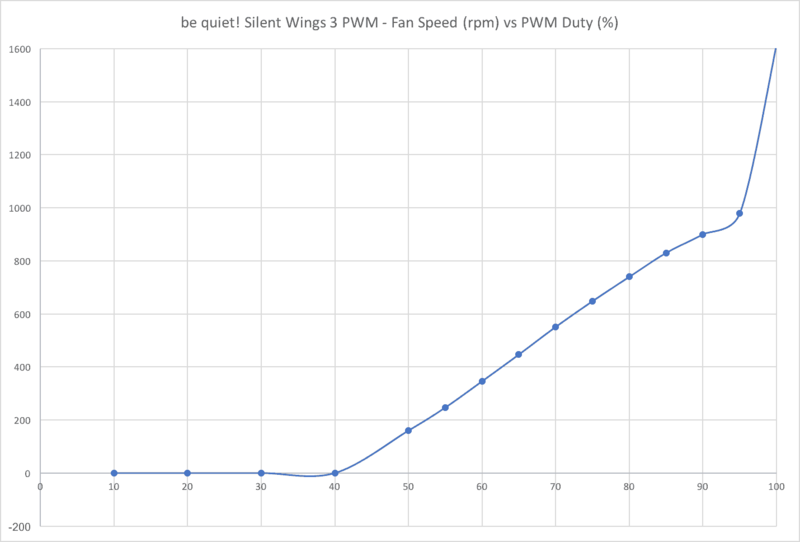 But offering no fan speed control and also being impossible to change after the system is fully assembled I opted to just stick the best fan I could find in there; a Silent Wings 3 (4-pin) PWM model. Removing the existing fan required disassembly of the top of the case which is screwed rather than welded – after much swearing I achieved this task. A set of ball tip hex screw drivers proved invaluable in working with this case. One note of thanks to HG Computers who did a damn good job at ensuring no seriously sharp edges on this case. My knuckles thank you. The case is well made out of very thick aluminium (6mm top, 4mm middle and 5mm base) but is also super light. It’s very fiddly to work with however and a lot of care had to be taken to not scratch it up. 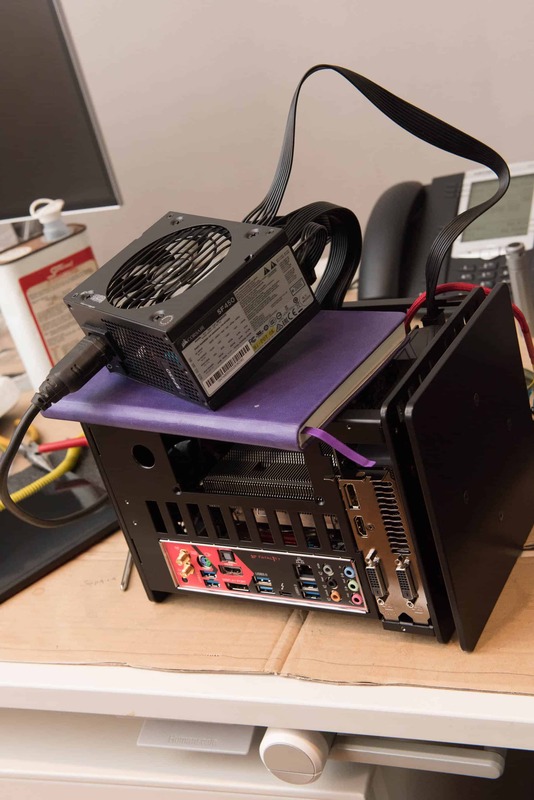 One major issue for newbies is that none of the included screws can hold the PSU in place. 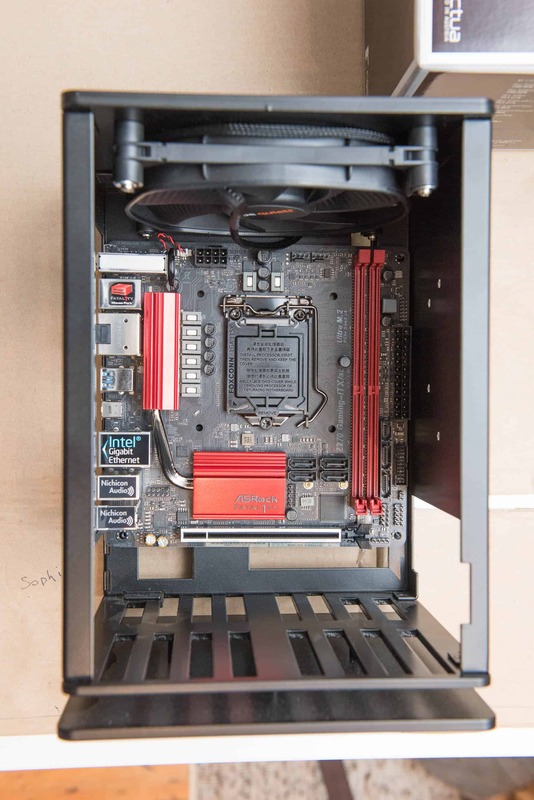 PSUs typically need 6-32 screws rather than machine screws (which the case only comes with). Thankfully I have a bajillion screws of every shape and size so it wasn’t a huge problem finding small, flat countersunk 6-32 screws (most NAS boxes come with a bunch for mounting the drives to sleds). Once the parts arrived it was go time, and what followed took all day and well into the night. It was quite possibly the trickiest machine build I’ve ever done. And damn near cracked the locking tab on the graphics card. 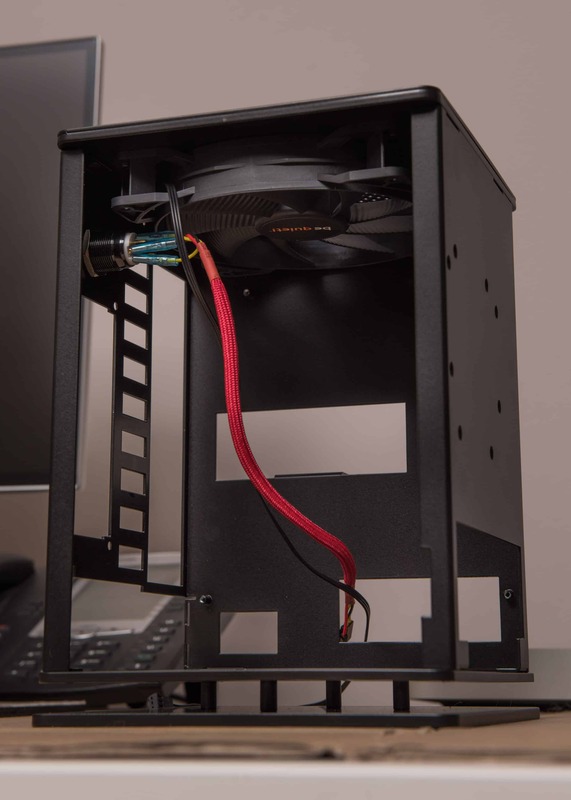 Fortunately I had just enough space to unscrew the hex bolts holding the left vertical strut to the base of the case. After loosening that (took a lot of force and a quality hex driver) I was barely able to get the graphics card to clear and sit where it needed to go. No harm, no foul (besides a few scuffed memory socket tabs. If I’d loosened the vertical strut before hand this step would have been much easier, and in fact HG got back to me the day after (finishing the build alas) with exactly that suggestion. 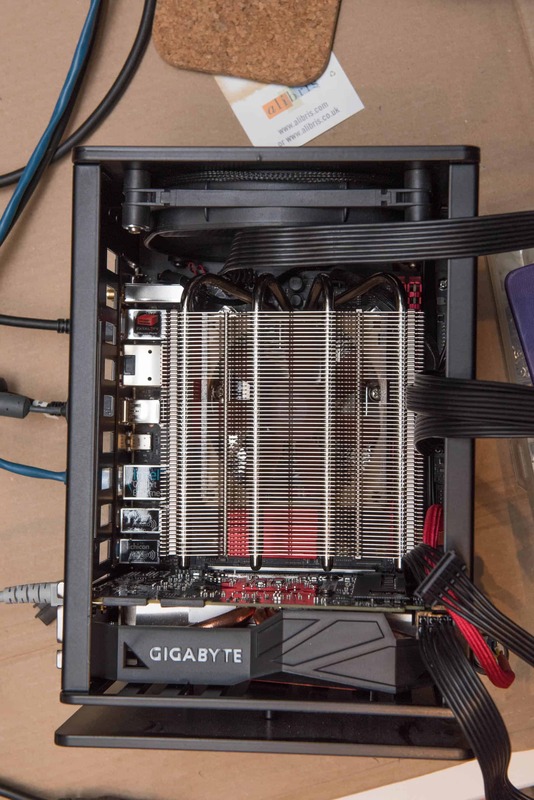 You really want to plug every cable in before mounting your CPU cooler in such a tiny space. In fact if using a 2.5″ SSD instead of an M.2 drive it’s way easier to secure and wire it before you put the motherboard and graphics card in. Routing the cables afterwards is otherwise ridiculously difficult. 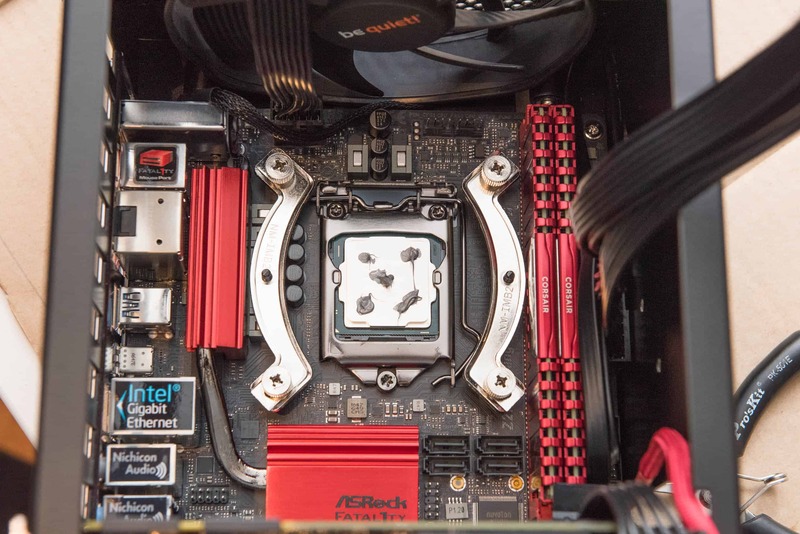 Here the patient has its CPU exposed and is ready to have some serious hardware mounted. 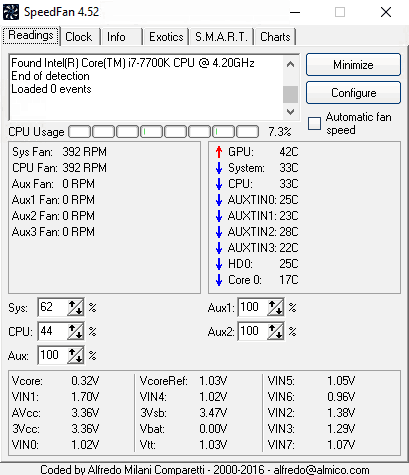 I of course used the best thermal paste (I could find at the bottom of my decade old parts bin) Arctic Silver 5. I routed the cables as neatly as possible ahead of time. 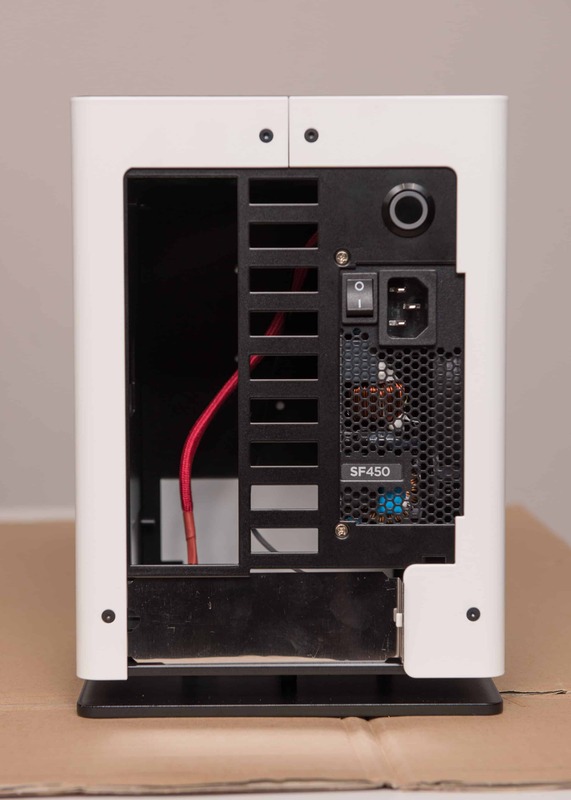 There’s no opportunity for do-overs with ITX cases. 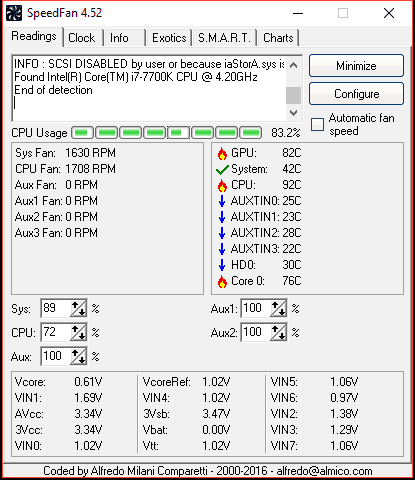 Setting the exhaust fan to max seems to have negligible effect on the GPU at high temps. 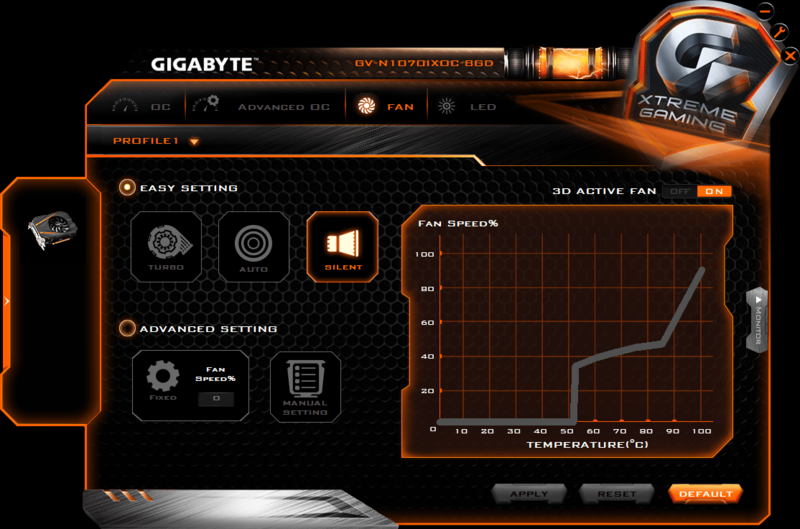 It does however influence the CPU and of course the internal system temp. 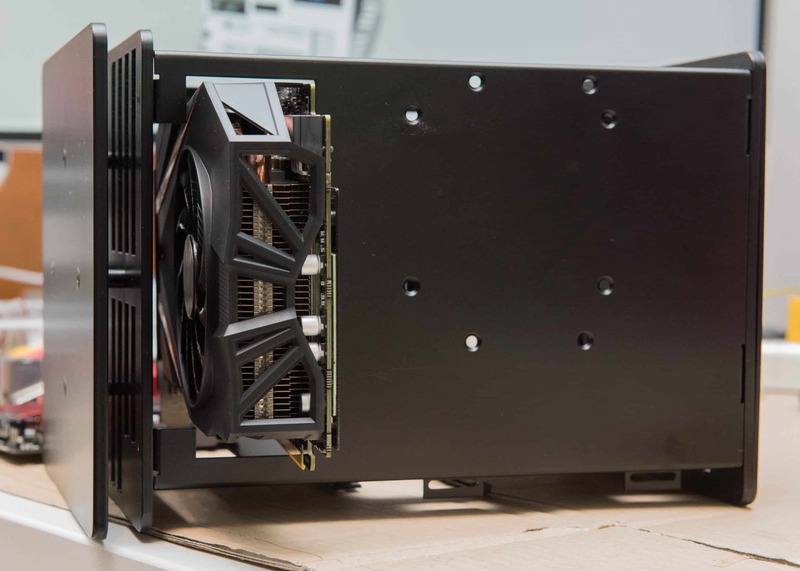 One downside of the Osmi is that the case blocks the exhaust on the front of the GPU completely which is a shame since without the case panel on you can feel a lot of heat exiting the GPU. I’d expected a much smoother fan profile – instead I got a jump from 950rpm to 1600rpm every few minutes, making the machine sound like a hairdryer revving for a race. 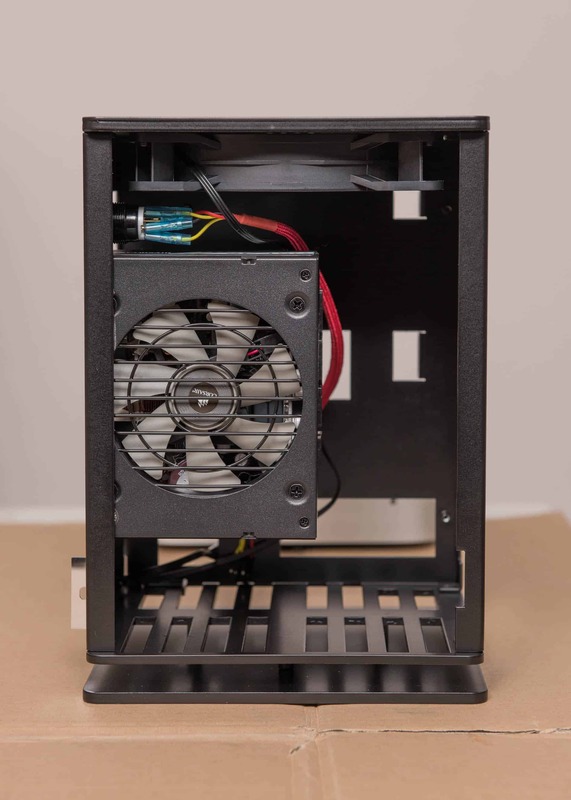 I might have been better off with a Noctua industrial fan like the NOCTUA NF-A14 industrialPPC-2000 PWM. All that remained was to install Gigabyte’s egregiously named XTREME GAMING ENGINE utility and set the graphics card to quiet mode. After all that I literally have to hold my ear an inch away from the top of the case to hear it at low to medium load. 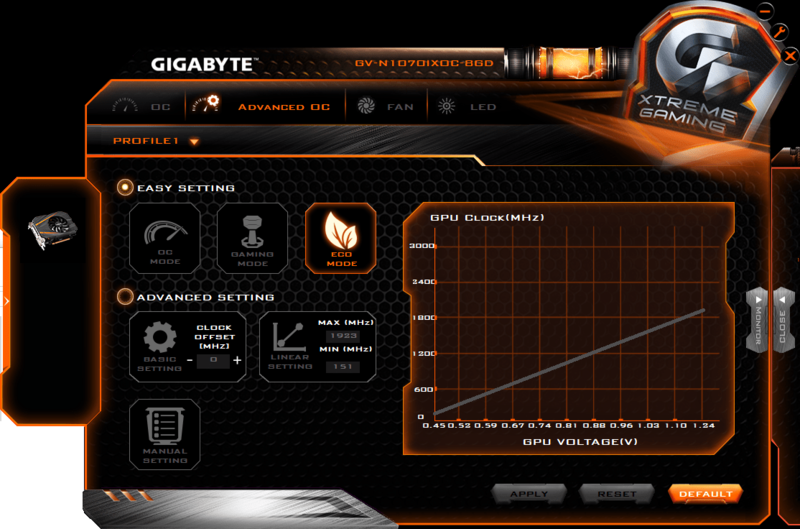 By comparison my Mac Pro (D700/6-core) would get about 10000 in Fire Strike 1.1 and 5500 in Fire Strike Extreme 1.1. By comparison the Mac Pro (Intel Xeon E5-1650 v2 6-core) would get 3762 in Single Core performance and 17848 in Multi-Core performance. About the same as a Mac Pro 2013. 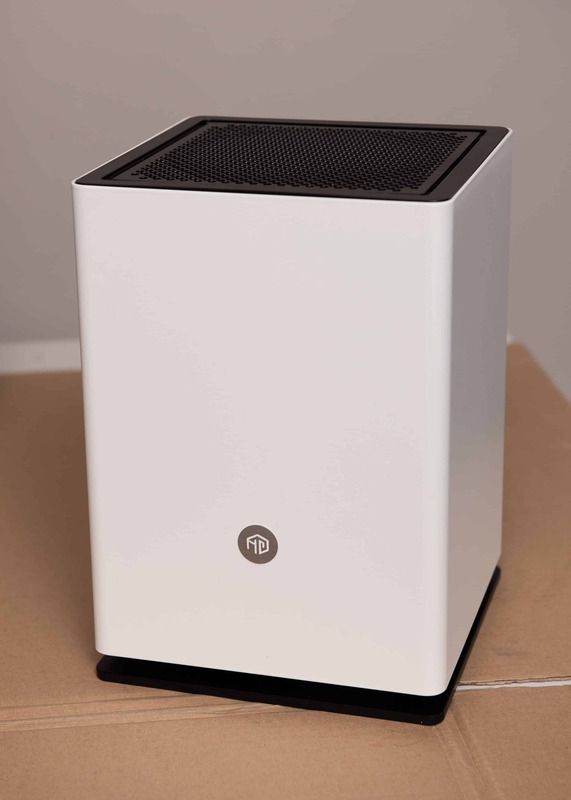 Mini ITX systems are most certainly a compromise in three key variables noise, performance and price. The smaller you get the more extreme you get in one of the two other variables. It’s certainly not a niche where smaller means cheaper. Starting with the case, which is critical in deciding everything that follows, the HG Osmi is not an easy case to work with. 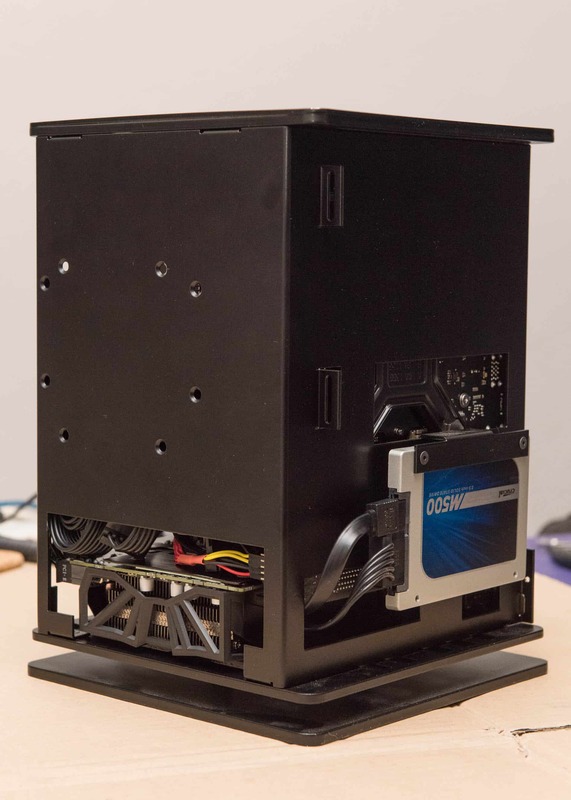 To excuse it somewhat, the field of ITX cases is still new and evolving and the HG Osmi is one of the smallest and smartest cases out there. It’s footprint is a tiny 7″x7″ (180x180mm) and it does forgo ventilation on the external casework in favour of a very clean aesthetic. This does mean compromising on practical aspects, not too unlike Apple’s 2013 Mac Pro for example, which the Osmi was clearly inspired by. 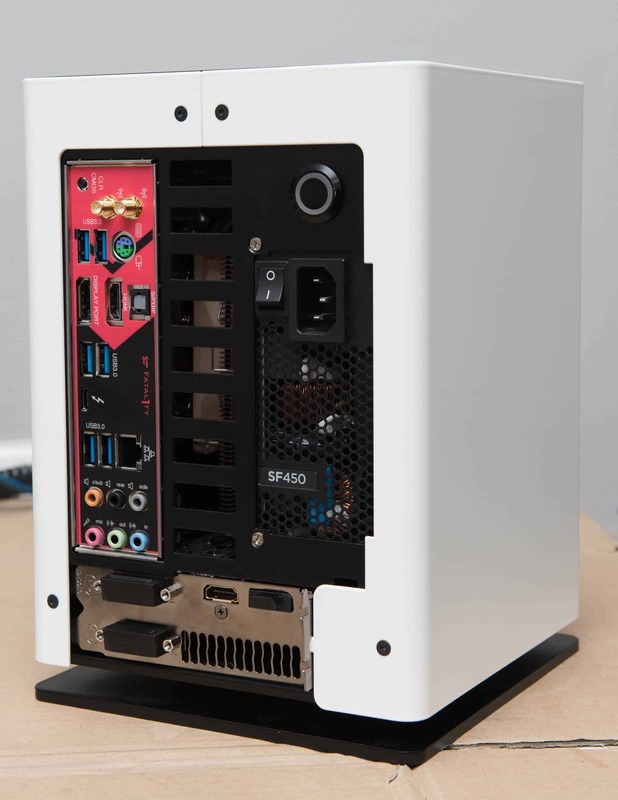 As a heavy Apple user who hasn’t built a PC in close to a decade I have to admit I was surprised at how fast a small and quiet custom built PC can be today. 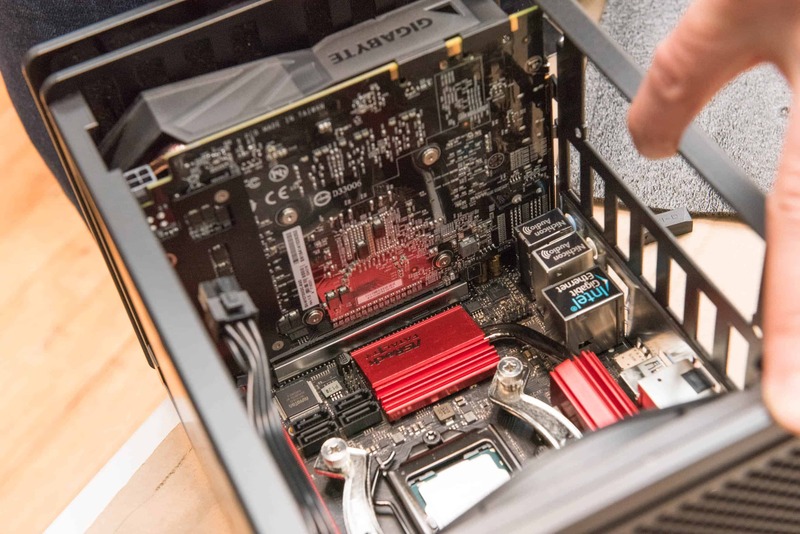 With the introduction of AMD’s Ryzen line-up of processors it’s entirely possible to build a workstation with 8 CPU cores, 64 GB of RAM and 2 TB of NVMe storage in a tiny, portable footprint. 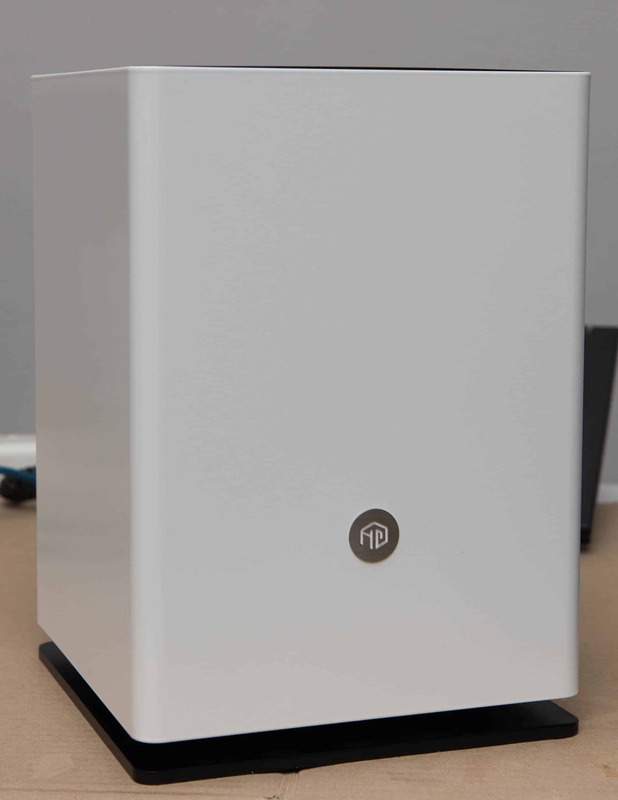 In some ways I think that’s the 2013 Mac Pro’s legacy – it showed the industry that there is a market for small and powerful workstations. Maybe I’m wrong on that, maybe I’m not – either way this new machine is nearly as small and quiet and surpasses its predecessor in performance and price. 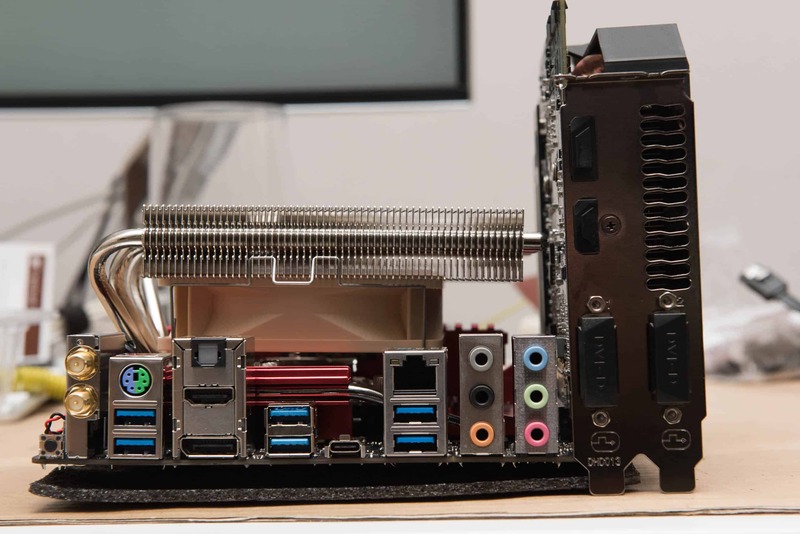 It’s nice to see that powerful workstations don’t have to be monstrously big anymore.